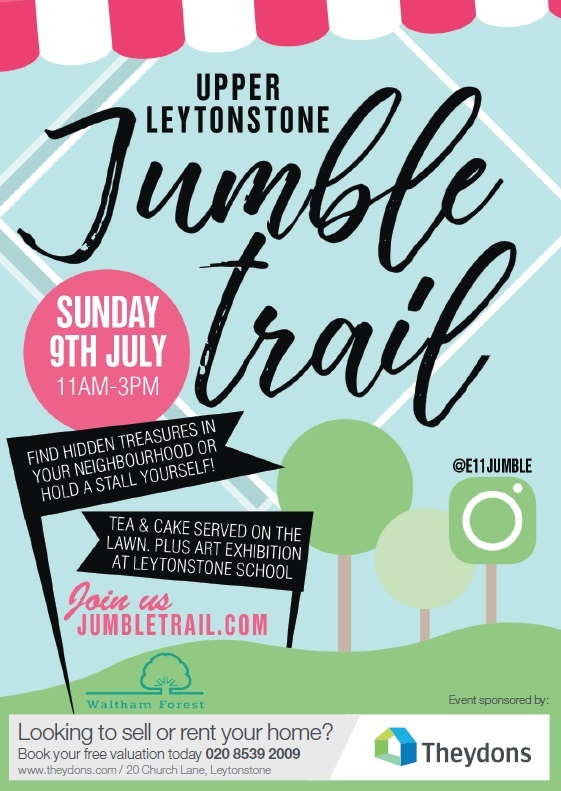 Theydons are pleased to announce our support for another amazing community event here in Leytonstone, this time being the brilliant ‘Upper Leytonstone Jumble Trail’ organised by the friends of Leytonstone School. What is the ‘Upper Leytonstone Jumble Trail’ you ask? Well it’s essentially like a big car boot sale but on your street, providing you with the perfect opportunity not only to clear out anything that you have lying around your home but also a great way to meet your neighbours and grab a bargain or two in the meantime! Once you are all shopped out head on over to the front lawn outside of the school for some vintage tea and cakes, this is also where you will be able to find an Art exhibition put on by students, creating the all round perfect way to spend a hopefully sunny Sunday here in Leytonstone. For those of you who do not live within the radius you are welcome to have a stall outside the school. To do this just plot your stall at the school when registering. (Tables and chairs provided at the school only) The £5 registration fee will go to school funds. After last years huge success the ‘Jumble Trail’ are hoping for bigger and better things this year and we would love as many of you to get involved in such a fantastic local event!